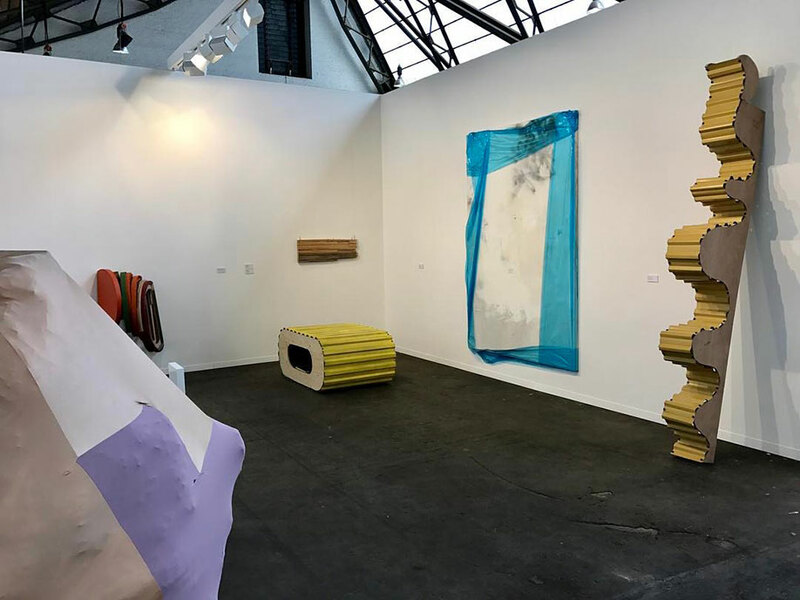 As a gallery with a strong focus on materiality, FOLD decided to exhibit abstract sculptures by five different artists. Leaning against the wall, doubling as a table and nestling around the corner, the sleek and minimalistic sculptures all show an interesting symbiosis between natural and artificial materials. The piece that we loved the most was Ellen Hyllemose‘s enormous gym bag made out of purple, beige, grey and rose-coloured pieces of Lycra. Moulded into its uneven shape by the pieces of cardboard and paper stuffed inside of it and stitched together with red garn in some of its parts, the untitled sculpture has a fascinating anthropomorphic quality to it that makes it worth to go see it in person.